Pianists generally use the left hand for chords and the right for melody. That’s why when you watch one play, the hands cross when the lead is played on the lower keys. Thus, the term “two-handed” refers to one who makes full use of the entire range of the piano, and is as skilled with the left hand as with the right. Mike Jones is such a musician, employing pre-World War II jazz styles known as stride and swing. 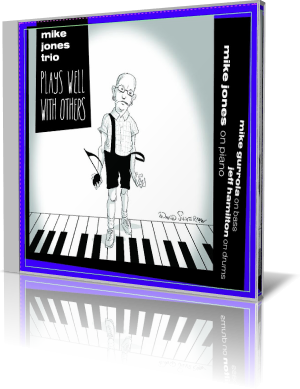 Plays Well With Others (Capri Records, 2013) by the Mike Jones Trio presents interpretations of 11 popular songs, as well as two originals. With Jones are bassist Mike Gurrola and drummer Jeff Hamilton. “Box Viewing Blues” is one of two Jones compositions. It’s a playful, sassy piece. The trio is tight, and Jones’ dexterity comes through. There are songs that put you in a good mood, and there are songs that seemingly have the power to heal wounds and bring dead plants to life. This is one of the latter. For “Corcovado,” Gurrola plays one line of the verse, and Jones takes the second. The tempo is faster than normal for this bossa nova classic. After a couple of passes of the original melody, the trio takes off on an adventure. Jones is musical director for the Penn & Teller Show in Las Vegas. He graduated from the Berklee College of Music in 1986. After establishing himself on the East Coast of the United States and with floating jazz festivals aboard cruise ships S.S. Norway and Queen Elizabeth II, he moved to Las Vegas, where he drew the attention of Penn Jillette. Jones lives in Las Vegas with his wife, author Cathe Jones.